Kenefick will appear at 7 PM, May 20 at the Longview Women’s Club, 835 21st Ave. The program is free and open to the public. 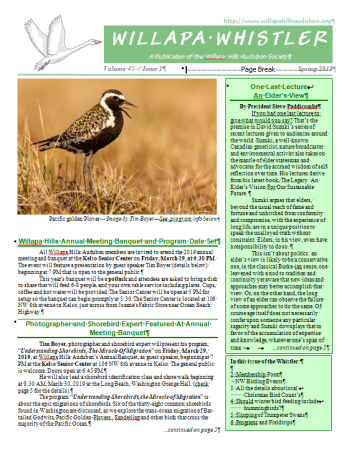 Whether you are a birder or not, join Willapa Hills on this tropical adventure. 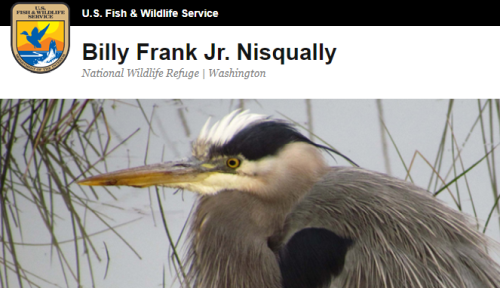 Join WHAS for a return to Billy Frank Nisqually National Wildlife Refuge to check out migrating song birds. Our breeding songbirds should be back from their long journey to southern and warmer climes in Mexico and South America. We will get to see a different refuge as the trees will be leafed out and most of the waterfowl will have left for their breeding grounds in Alaska and Canada. There should be some nesting waterfowl, such as Mallards, Cinnamon Teal, and others. The weather should be milder than we endured in February. 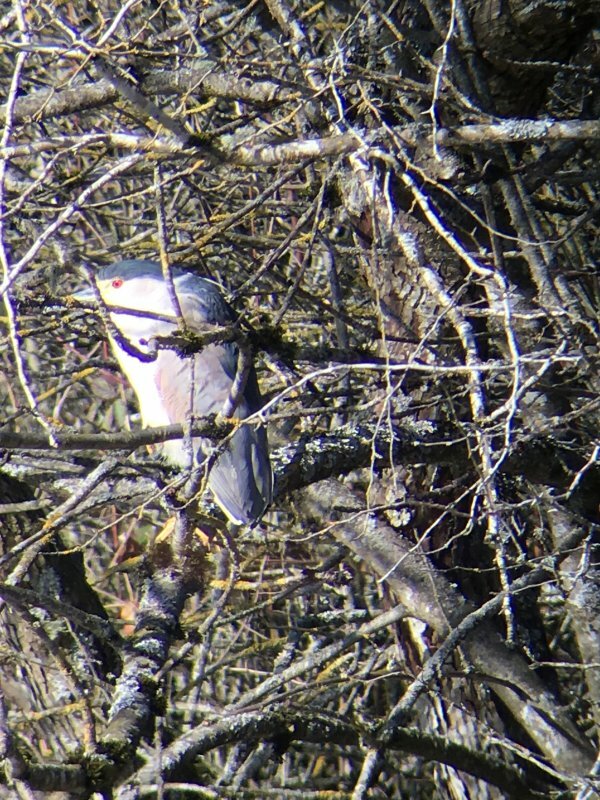 On Tuesday, January 1, 2019 the 37th Cowlitz-Columbia Christmas Bird Count (3CBC), the first of the New Year, was conducted. We had 19 field observers and 3 feeder watchers out for the day peering through the fog and finding 89 species of birds. The species count this year was the lowest since 2010. Since 2010 we have had 4 years with over 100 species and the rest in the mid 90’s. Our highest species number was 108 in 2013 and 2016. 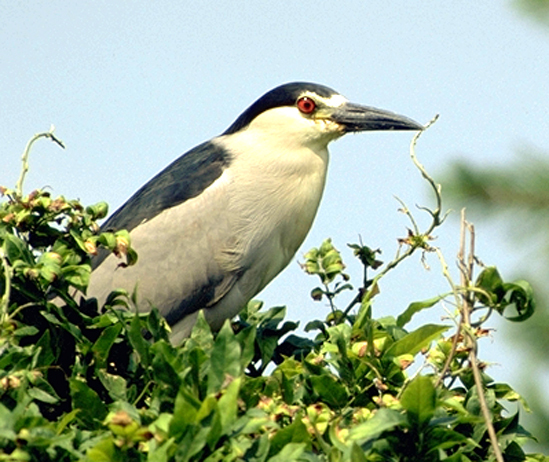 The count circle was begun in 1982 with 57 species and 4,545 individual birds found. This year we found 89 species and 14,721 individuals. We recorded some all time individual high counts; 597 Tundra Swans, 394 Ring-necked Ducks, 165 Buffleheads, 664 Rock Doves, 13 Red-breasted Sapsuckers, 200 Western Scrub Jays, 98 Golden-crowned Kinglets, 768 American Robins, and 13 Brown Creepers(tied a high). Thank you to all our field observers and feeder watchers. We found 109 species (about average for this circle) plus six additional count week species, despite fairly steady rain. The most abundant species in the circle was Greater Scaup with a count of 23,832, followed by Cackling Goose with 12,240. The most unusual species found were a Lesser Goldfinch (a Wahkiakum county and Wahkiakum CBC first) on Puget Island, a Harris's Sparrow on Aldrich Point Road in Brownsmead, and a Lesser Yellowlegs on Jackson-Pentilla Road in Brownsmead (a first for this CBC). New high counts were set for Trumpeter Swan, Cinnamon Teal, Ring-necked Duck (302, previous high 188), Black Phoebe (10, previous high 4), California Scrub-jay, Black-capped Chickadee, Brown Creeper, and American Robin (683, previous high 394). We missed Townsend's Warbler for the first time. A count of 1 Western Grebe was disturbingly low (previous low 23, previous high 245). 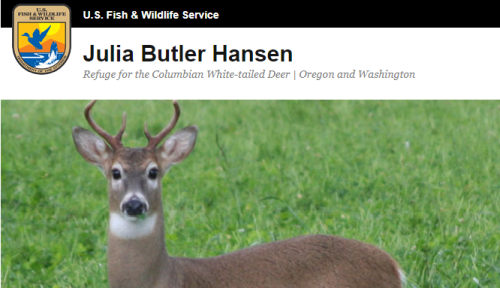 The count was hampered somewhat by the government shutdown, as the Julia Butler Hansen Refuge boat could not be used to access the more inaccessible islands (Marsh and Karlson Islands) of the Lewis and Clark National Wildlife Refuge. Nevertheless, most islands were accessed via kayaks. Thanks again to everyone for volunteering! The Leadbetter Christmas Bird Count (and the WHAS) would like to thank the generosity of all of the private property owners and businesses who allowed the birders to access their property to count birds. A special thanks to Anita’s Café in Ocean Park and the Hunter’s Inn in Naselle for feeding the birders breakfast and dinner respectively. The Audubon “Leadbetter” Christmas Bird count falls within a fifteen mile circle on a map that includes the peninsula from 185th street north to the tip and around Willapa Bay as far north as Bay Center. There were 28 hardy birders that volunteered their day to count as many birds as they could within this circle. The total number of species that were counted on Dec. 15th was 92, down slightly from previous years. The birders had a good day of weather between our coastal storms, but the storms played a role in the low numbers. The Spring 2019 Whistler is available now. What a month we had in February for weather, as we're just not used to it being that cold for such a prolonged time. The snow in the foothills kept birders out of locations with much elevation, and the cold in the lower flood plain areas didn't get us out in those spots as much as usual either. Still, we enjoyed the greater than usual abundance of Varied Thrush at low elevation where they were pushed by the snow cover in their more typical haunts. We also had a couple flocks of Western Bluebirds found, one each at the south and north edges of Cowlitz County in mid month, just a bit earlier than usual for this early migrant species. One group was in the Woodland Bottoms and the second along the Cowlitz River right at the Lewis County line. Could these birds have been easier for us to find as they may sometimes use tree farm clear cuts at slightly higher elevations for migration stops and been pushed lower by the snow cover? Birding is always interesting even in spite of the inclement weather. 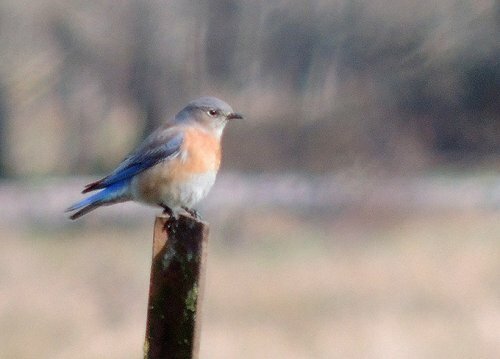 Many thanks to Terry Anderson for providing the attached photo of one of the Western Bluebirds seen in the Woodland Bottoms on 2/9/19.